Anyone familiar with Jurgens vans will know they have a very distinctive look about them. Although the company has South African origins, the flavour is European in many respects. But Jurgens' new Solaris C66 line is somewhat a departure from the manufacturer’s normal style. It’s not only in looks either, because Jurgens describes its new Solaris range as “the best of premium caravanning” and it comes with a price to match. 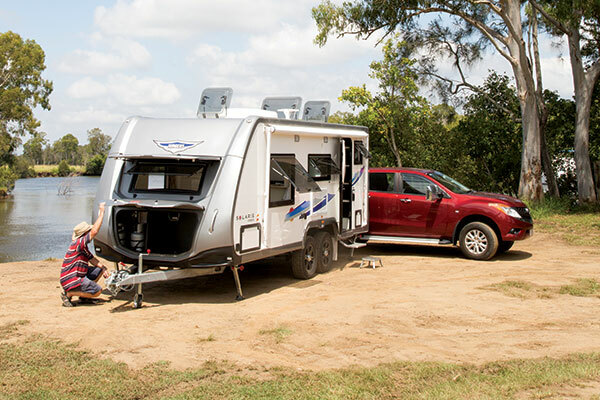 Through brilliant organisation, (ahem, sheer luck), when I contacted Kratzmann Caravans’ operations manager Dale Lawrence, I was able to get my hands on one of the first of the new Solaris caravans. Don’t tell our Editor Tim van Duyl that. He thinks it was my amazing psychic sense that detected a new caravan model fresh out of the factory. 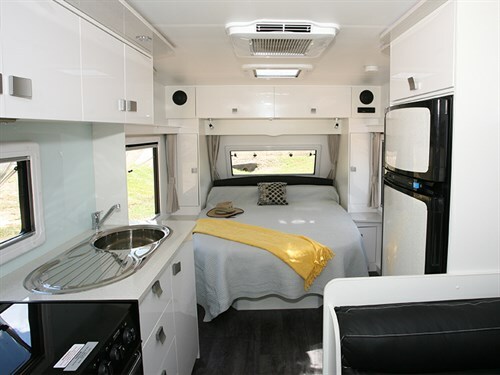 Currently, there are three layouts in the Solaris range, two variants with a front island bed/rear bathroom arrangement and a third with bunk beds in the rear. All have an external length of 6.62m (21ft 9in) and the model I was able to get my hands on was the 6603 with a rear habitation door. It comes with the aforementioned bedroom and bathroom setup, along with a nearside kitchen bench and an offside club-style dinette. As with this Solaris design, something that distinguishes Jurgens vans from many other Australian models is the Optima chassis, which is bolted together rather than welded before it's hot-dipped galvanised. It is also different because mostly C section rails and cross members are used. Just about every chassis member has punched holes — an effective weight saving device. I did wonder whether there are advantages for bolting over welding a chassis but I suspect it’s swings and roundabouts. Bolting is slightly more labour intensive but welding requires specialisation to produce a neat and effective job. A look under the van reveals the independent coil spring/trailing arm suspension, also the two 80L water tanks fitted between the wheels for consistent stability, although fitting the optional 80L grey tank might change weight balance with usage. The spare wheel is mounted between the rails at the rear. The Solaris has a frameless structure, relying on composite walls, roof and floor to give the desired combination of strength and weight. All having a high-density foam core, the walls are 25mm thick, the roof 29mm and the floor 38mm. The floor is thicker for strength and insulation. Having a well-insulated floor is definitely an asset in cooler areas and less so in warm weather. A feature of note, is the streamlined look of the overall body structure — even from the rear it does not look too boxy. Certainly, the two-tone colour scheme adds to the van’s appearance. As does the location of the gas cylinders, which are stored in a compartmented area in the front boot. That takes up storage space but it’s a neat arrangement. Contemporary colour scheme, anyone? You’ll get that with the Solaris, and in this case, it's almost all in black and white. The white results in an extremely bright interior, aided by the large windows by day and the LED light fittings by night, that include concealed floor lighting. Of note are the ceiling panels that extend from the overhead lockers and run down both sides. In addition to being decorative, they hide the LED strip lighting for a pleasant diffused glow. It’s not immediately obvious but opening a few cupboard doors and lifting seat cushions reveal weight savings made by cutting holes into the ply timber. A good example is in the hinged seat bases, which appear to be more hole than ply panel but still do an effective job of supporting the seat cushion. They are also less heavy to lift to get to the under-seat areas. Up front, the bed has an unextended length of 1.73m (5ft 8in) which makes the walk around area look good, however, many will leave it extended at 1.93m (6ft 4in), which looks like it might encroach on the nearside kitchen bench area and the offside fridge cabinet. For those who like a little soft music to fall asleep to, the radio/CD player and speakers are located in the bed head cabinetry. You also get expected features like overhead lockers and side wardrobes. An additional item tucked into the corner beside the fridge is an angled cupboard fitted out with multiple shelves. The top one being more of a control panel area with mains circuit breakers, BMPRO battery management touch pad, hot water switch and 12V outlet. Having the fridge butted up against the bedroom area is a little unusual but it works, as the weight of the fridge is above the wheels rather than behind them. Apart from that, the kitchen area is relatively conventional with a good set of cupboards, drawers and overhead lockers. The latter have shelves fitted making them suitable for smaller items. Even with the four-burner cooker/grill/oven and stainless steel sink avec drainer, there is still a bit of benchtop space. An option with this van is the choice of a club-style lounge as fitted here, or the more traditional cafe dinette. The club-style is probably better suited to two people and does come with a slightly odd-shaped table but that’s okay because the dinette isn’t symmetrical and it suits. Something else that suits are the hinged footrests on either side, fitted with decent-sized cushions. It seems to be a Jurgens style of doing things but the master switch for the 12V electrics is located under the rear seat, near where the battery is. In this case, it’s an okay location because you can just lean through the doorway from outside to turn on the lights on but in other cases, it is not so. Caravan bathrooms, particularly the full-width rear variety tend to follow a standard design, that is, with a shower cubicle on one side and a cassette toilet on the other. About the only variation here is the loo and the wall-mounted Daewoo washing machine occupy the nearside corner rather than the shower cubicle, seen elsewhere. A noticeable feature of this bathroom is the large window above the toilet and the larger than usual marine-style hatch in the middle of the roof. The vanity cabinet includes a good-sized wall mirror, washbasin, four drawers and a tilt-out laundry bin. A useful touch since dirty laundry is always with us. Deviating in design from other Jurgens ranges shouldn’t impact its sales, especially as the Solaris still looks different to the mainstream caravan product. Although it’s ATM is over the so-called Prado limit, i.e., 2500kg, it still can be towed by a wide range of vehicles without a problem. In addition to that, the Jurgens' built-in “dirt-road capability” is an attraction. To enquire about this caravan, please phone (07) 3888 2755.